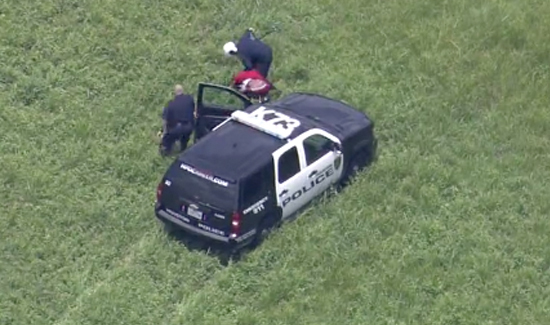 A wild scene unfolded Tuesday in Houston when a police officer jumped out of a helicopter to tackle a burglary suspect who had fled into a field. It all started when Houston cops responded to a call about a burglary. When they arrived at the residence, two suspects drove off and the chase ensued. A Houston police department helicopter followed one suspect into a field.The suspect was struck by a police car, but that didn’t stop him. Concerned that they would lose him in the field, the helicopter pilots decided to land so Officer Steven Borgstedte could pursue on foot. The video above, captured by local SkyFOX cameras, shows Borgstedte sprint across the field and tackle the suspect. After a brief struggle, the man was placed in handcuffs with help from other officers. Borgstedte said he has been patrolling for years, but this is the first time he’s ever jumped out of a chopper to make an arrest.